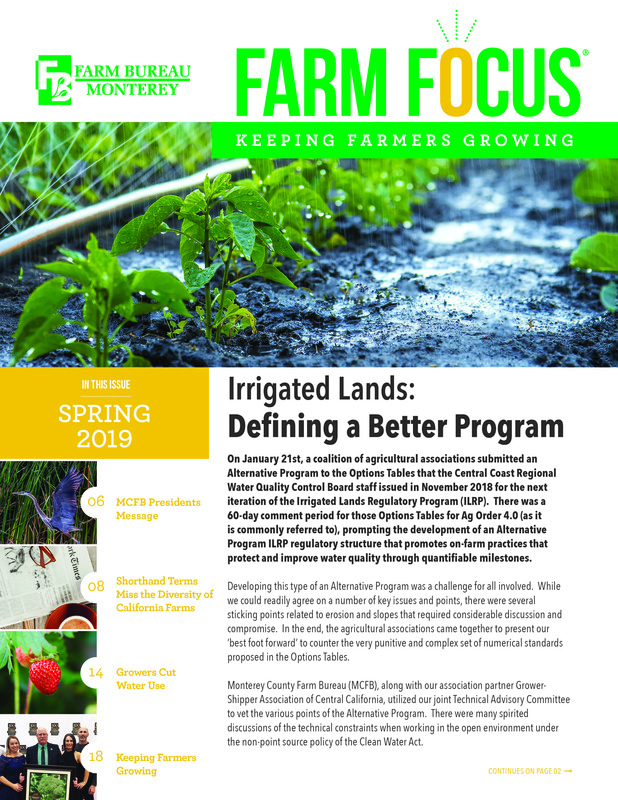 The Spring 2019 issue of Farm Focus, Monterey County Farm Bureau's quarterly publication, has been published and is made available to our Agricultural, Associate, Collegiate, Friends of Monterey County Farming, and Business Partner members of Farm Bureau as well as local orgnaizations where people are interested to know about farms and farming in Monterey County. Farm Focus has an exciting, new look this year! Advertising opportunities are available; please see our Advertising webpage for more information. Guest article submissions are also welcome; please review our guidelines for submissions. Click on the issue cover to view the PDF file. Prior issues of Farm Focus are available on-line by clicking here.